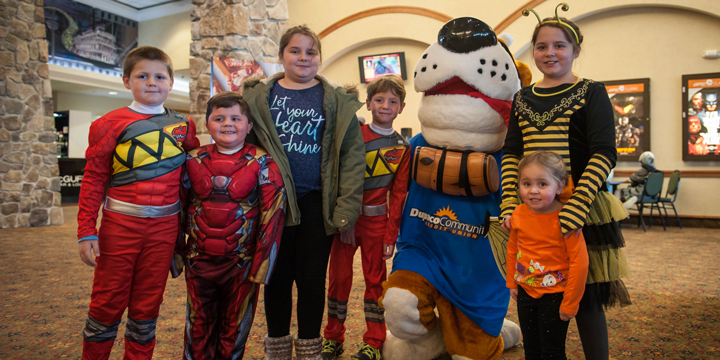 Young DoPack members pose for a photo with Dollar the Dog at a Dupaco-sponsored fall event in 2017. From costumes to candy, Halloween expenses can be downright frightful. Americans plan to spend an average of nearly $87 on Halloween items this season, in line with last year’s record spending, according to the National Retail Federation’s annual survey. Among the items being purchased: pet costumes. Nearly 20 percent of celebrants—or 31.3 million Americans—plan to dress up their pets this year, with millennials (ages 25-34) being the most likely to do so. Vesperman Farms in Lancaster, Wis.
MORE: Learn how you can save at these destinations and other upcoming events! If your family enjoys outings, find out whether there are fall festivals in your area. Many times, these events are budget-friendly. Or, check to see whether the place you’d like to visit offers reduced rates during weekdays or daytime hours. If possible, plan your trip around those times to save even more. Ask friends and family members if they have costumes or Halloween decorations they’re willing to swap with you. Turn it into a fun gathering by inviting a group of people to your home for a Halloween-themed swap party. That way, everyone walks away with some fresh Halloween gear. MORE: Learn how to host a successful swap party. You can find gently used costumes or the materials needed to create your own at a fraction of the price at consignment stores. Can’t find what you’re looking for? If you buy brand-new, take advantage of store sales and coupons to avoid paying full price. Candy can get expensive fast. Give your budget some breathing room by buying candy in bulk. You don’t have to give away handfuls to each visitor, because your trick-or-treaters will have no shortage of candy in their pumpkin buckets. An estimated 70 percent of Halloween celebrants plan to hand out candy this year, the National Retail Federation says. Stock up on deeply discounted costumes and decorations the day after Halloween. You’ll thank yourself one year from now! Until then, your kids will have fun playing dress-up with the post-Halloween deals you scored.